"Magnet wire" is small-gauge wire insulated with a thin enamel coating. It is intended to be used to make electromagnets, because many "turns" of wire may be wrapped in a relatively small-diameter coil. Any gauge of wire will work, but 28 gauge is recommended so as to make a coil with as many turns as possible in a small diameter. Effects of magnetic coupling on voltage regulation. Effects of winding turns on "step" ratio. Wrap two, equal-length bars of steel with a thin layer of electrically-insulating tape. Wrap several hundred turns of magnet wire around these two bars. You may make these windings with an equal or unequal number of turns, depending on whether or not you want the transformer to be able to "step" voltage up or down. I recommend equal turns to begin with, then experiment later with coils of unequal turn count. Join those bars together in a rectangle with two other, shorter, bars of steel. Use bolts to secure the bars together (it is recommended that you drill bolt holes through the bars before you wrap wire around them). Check for shorted windings (ohmmeter reading between wire ends and steel bar) after you're finished wrapping the windings. There should be no continuity (infinite resistance) between the winding and the steel bar. Check for continuity between winding ends to ensure that the wire isn't broken open somewhere within the coil. If either resistance measurements indicate a problem, the winding must be re-made. Power your transformer with the low-voltage output of the "power supply" described at the beginning of this chapter. Do not power your transformer directly from wall-socket voltage (120 volts), as your home-made windings really aren't rated for any significant voltage! Measure the output voltage (secondary winding) of your transformer with an AC voltmeter. Connect a load of some kind (light bulbs are good!) to the secondary winding and re-measure voltage. Note the degree of voltage "sag" at the secondary winding as load current is increased. 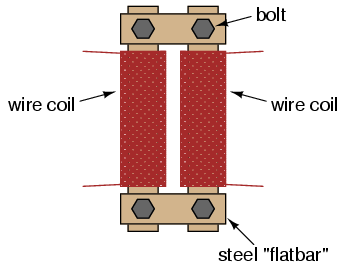 Loosen or remove the connecting bolts from one of the short bar pieces, thus increasing the reluctance (analogous to resistance) of the magnetic "circuit" coupling the two windings together. Note the effect on output voltage and voltage "sag" under load. If you've made your transformer with unequal-turn windings. try it in step-up versus step-down mode, powering different AC loads.